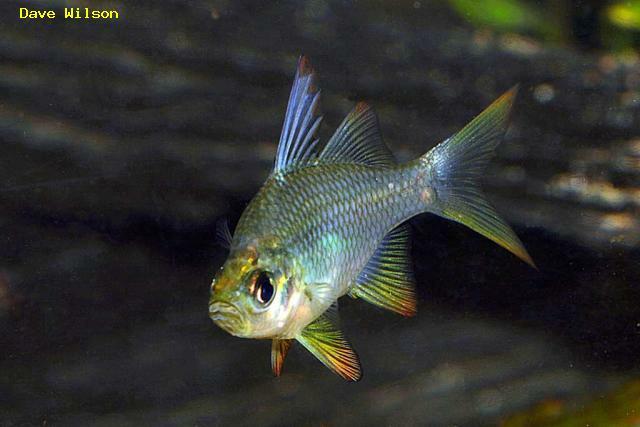 Description: size, colour : A perch shaped fish that is not quite as clear as other glassfishes but has a dark pattern around the scales. The males in good breeding condition will have mauve or red and tellow tinge to their fins. It grows to 100 mm but more commonly found 70 mm. Habit: A schooling species, generalyy found in deeper billabongs and slower parts of deeper rivers adjacent snags and vegetation belts. Breeding: It is an egg scatterer, depositing eggs on the bottom or in dense vegetation. The eggs are left to hatch on their own once laid. There is no parental egg minding or fry raising activity once eggs are laid. Aquarium notes: Relatively easy to keep, not too fussy about water quality. It grows to 100 mm so a larger aquarium is advised, one that is about 90cm X 45cm X 45cm would be suitable for about 8 or ten. They school when conditions for schooling are created. It is difficult to breed in the aquarium but relatively easy to induce to spawn in a pond of 3 to 5 tons. Will take a prepared diet of minced and prawns and fish fillet. Also takes aquaculture crumble. Tank companions, It would be a good community aquarium fish with all the rainbows and native catfishes and other larger natives that grow over 100 mm. It should not be trusted with small blue-eyes or small shrimps. Reticulated Glassfish fry a few days old. The units on the eyepiece are 2.5 units to the mm, so the fry is a bit over 5 mm long.